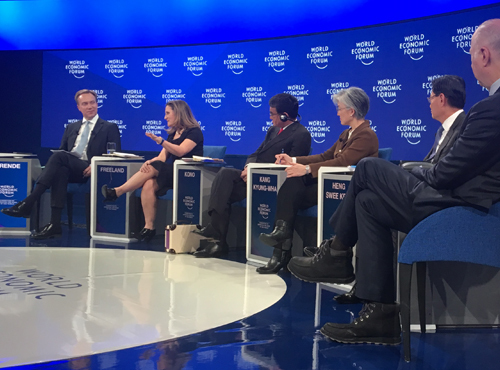 David McKay, President and CEO of RBC, attended the annual meeting of the World Economic Forum in Davos, which this year was themed around globalization and the role that intelligent technologies will play in connecting everyone and everything in the digital age. Dave shares his views on the subject and provides his key takeaways from WEF’s 2019 gathering. If you didn't see Davos on the news this year, you weren't alone. A decade after the financial crisis, when the World Economic Forum and its winter wonderland were a hotbed of debate and protests, the WEF's 2019 gathering was a subdued affair. Without Donald Trump or Vladimir Putin, or Theresa May, Emmanuel Macron and Justin Trudeau, and all the media who travel with them, the tiny Alps town felt positively serene. Maybe the quieter atmosphere was needed for some reflection on where the world’s gone since the crisis, and to cast forward to where it might be headed. This was my fourth Davos, and in many ways, the most enlivening. Clearly, the U.S.-China trade fight, and uncertain course of Brexit, had the gathering on edge. But the serious conversations focused on what lay beyond those crises. This year’s theme was Globalization 4.0, a concept hatched at Davos to explain the coming age of intelligent and ubiquitous technologies that will connect everyone and everything in ways the previous engines of globalization – steam, electricity and computing – could not. In this new era, smart machines will shape our companies and communities, and advanced technologies will be embedded in every object, and perhaps every person we encounter. It will be an age when data isn’t just the new oil; it will be the new water, the lifeblood of everything our society will want and need. The prospects can be unnerving, but I came away encouraged, with more clarity about how transformative technologies and a new generation of thinking can take our world into the next stage of globalization, and make it more decent, democratic and distributed. "The Chinese came in force to Davos, with a clear message that they will not be subjected to Washington’s worldview." Two years ago, Xi Jinping was the star of Davos, projecting a new vision for a world with China at the forefront. Last year, Donald Trump stole the show, in a very different way, projecting an America-first worldview. Their absence this year had the unexpected effect of placing their tense relationship into perspective. The business leaders at Davos expressed a quiet confidence that the U.S.-China trade dispute would be resolved in the next few months. With the Nafta negotiations largely behind them, Trump’s understaffed trade team has been able to focus on China. The Chinese also have come to understand who, and what, they’re dealing with. And both sides appear to be seeing the economic reality of trans-Pacific supply chains, which are too complex to dismantle without serious harm to both countries. Even if the trade dispute is resolved, it will be a beginning more than an end. In Xi, the Americans have discovered a Chinese resolve to create a new international economic order. And in Trump, the Chinese have discovered an American resolve to resist it. The Chinese came in force to Davos, with a clear message that they will not be subjected to Washington’s worldview. They see themselves indisputably as the world’s No. 2 economic power, on their way to No. 1, and believe it’s up to the West to adjust. Given China’s success over the past quarter-century, they even think their model can do the world a lot of good. No area is more contentious than technology and intellectual property rights, which the Chinese want to develop in their own manner. Wang Qishan, the powerful vice-president who led the delegation, delivered a blunt message: the world must allow China the “right to take part in the global technological governance system as equals.” That word – equals – popped up again and again. The Huawei case seemed to be an unofficial member of the Ottawa delegation, shadowing federal cabinet ministers at every meeting as they tried to build support for the Canadian side. But interest in the company extended far beyond the extradition case of Meng Wanzhou. Huawei’s emergence as a global leader in telecommunications equipment had Davos wondering about the next generation of mobile technology, and whether the Chinese giant would lead the way. I found it intriguing that despite the buzz, many of the world’s business and government leaders seemed to know little about 5G. On the surface, the technology should help us download data and browse the Internet at up to 100 times the speed of today’s smartphones. That will make our lives more convenient, for sure. Perhaps more importantly, 5G could also become the backbone of a new economy, with the speeds and consistency needed for smart objects – self-driving cars, delivery drones, digitally-enabled appliances – to connect with each other at the speed of decision making. It’s exciting stuff, to think of how 5G might make the Internet perform like electricity – always there, always on. But as with the development of electricity – AC versus DC – there’s a fierce debate about whose technology is better. There’s little doubt Huawei is a leader, and likely to get much better as China turns its 5G focus on its bustling cities. Will we miss out on China’s advancements if we shut out Huawei? We know Beijing has sway over the company, and can compel it to hand over foreign data for national security reasons. But we also need to better understand how Huawei’s equipment would fit into the bigger technology stack that powers our mobile lives. Who can access our data will be a critical question in 2019 – not just for Huawei, but for everyone trying to wire our mobile world. I co-hosted a dinner for about 40 global CEOs on the final night of the forum, and when we turned our attention to the economy, the mood was cautiously optimistic. “Slowdown but not stagnation,” was a common refrain. McKinsey’s new global managing partner, Kevin Sneader, put it well: “When I ask CEOs at Davos about their business, they say, ‘Pretty good. I’m just worried about everyone else.’” That kind of anxiety can be positive, keeping business operators on their toes. It can also be dangerous, if they rein in investment and take fewer risks. Even though most said they expect a slowdown this year and into 2020, I got the impression other CEOs and investors still see space for expansion. The U.S. economy is running well, and China could begin to rebound once a trade deal is reached with Washington. Of course, Europe is struggling, with Italy in recession and Germany not far off. But there are plenty of other markets – India, Mexico, Brazil – that could be stronger growth engines. The risk is we won’t be ambitious enough going into the 2020s, to seize on new technologies and those expanding parts of the world. And if we’re not ambitious, and we settle for slow growth, we may fall short of the financial returns our shareholders demand as well as the social returns – jobs, services, stability – our societies expect. To do better, governments will need to give businesses and investors the right incentives, including smarter regulations, more coherent tax policies and a predictable trading regime. As the Economist noted in its Davos issue, under its cheeky cover line, “Slowbalisation,” we need to both manage the slowdown and think more boldly about the next cycle, and how to make it commercially led, socially minded and globally ambitious. Although Theresa May skipped Davos, she sent a squadron of ministers to convey her government’s confidence that it can secure a Brexit deal by spring. The Conservatives, despite their own divisions, clearly want an outcome that keeps them in power, and keeps the economy from crashing into the wall of a hard exit. We can expect some pretty tense negotiations up to the 11th hour, with an outcome perhaps not far off what May presented in December. The Brexit bullishness wasn’t exactly what the Davos crowd wanted to hear. In one session, with about 300 people in the audience, about 90% put their hands up to say they’d favour a second referendum, hoping the public this time would vote to remain in the European Union. Privately, British officials, and even British business leaders, said that’s not likely. A vote would take too long to organize, be too divisive and risk producing another contentious result. The May government instead believes it can manage a compromise over the Irish border, amongst other vexatious issues. That may be the easy part. If May wins the support of her party and Parliament, she’ll need to quickly win back business confidence. Investment in Britain is down about 20% since the referendum, and with each passing month, manufacturers, banks and others are moving jobs to the continent, or elsewhere. Mark Carney told a Davos audience Britain’s banking system should be fine, and can withstand plenty of shocks. But he made it clear that if the U.K. can’t lay out a coherent plan for its borders and trade, there’s little business can do to prepare. Perhaps ominously, as the British ministers tried to cheer up Davos, officials back home were laying out plans for food rationing, border patrols and possible civil unrest. If nothing else, such dire prospects should focus the British mind as the 11th hour approaches. "Several sessions at Davos looked at the need for a new approach to trade that would allow countries, and trading blocs, to opt into a reformed global system." She sees the rise of bodies like the Shanghai Pact, led by China and Russia, as an effort to build alternative systems to democracy and market capitalism. She praised the G20 as the sort of body the world needs, to keep countries and regions adhering to global principles, if not global rules and standards. It’s not impossible. Merkel pointed to the General Conference on Weights and Measures, which voted last year to change how we measure the basic kilogram, showing what global co-operation can do. That co-operative spirit is being put to the test at the World Trade Organization, whose fate hangs in the balance of a divided world. The WTO is the central plumbing of global commerce, connecting 400 preferential trade agreements and 3,000 investment deals, and yet it’s been stripped in recent years of its ability to function normally. It’s one reason global trade has been plugged up since the financial crisis. Several sessions at Davos looked at the need for a new approach to trade that would allow countries, and trading blocs, to opt into a reformed global system. As long as global principles can be maintained, the argument goes, the spirit of global trade can live on. This idea of plurilateralism, or a club of clubs, might even be a model for the newest challenges to Globalization 4.0: bioethics, cybersecurity and data. How appropriate to meet in Switzerland, a country synonymous with secrecy, to talk about 21st century privacy, as it pertains to data. While the Forum once pushed for a global approach to data, there’s a growing view that any governance system will be more balkanized. As Microsoft’s CEO Satya Nadella said, we were “naive” to think about a universal approach to the digital economy. The risk now is that each country will take its own approach to data and we’ll end up with the Internet equivalent of the 1950s airline industry. Small wonder they call it the “splinternet.” As countries like India and Thailand start to advance the use of digital identification for citizens, they’re wanting to keep their data on their soil, in a drive for “data localization” that’s likely to grow as people worry more about the use, and misuse, of their personal information. Data localization could also become a hindrance to innovation, if it undermines cloud computing and the efficiencies that go with it. Reality is, our data cross more borders every day than many of us appreciate. It’s why Singapore, a leader on so many digital fronts, is experimenting with some ideas around cross-border processing, to allow blocks of data to flow freely, while also maintaining a secure home for them. This will become even more pressing as countries try to incorporate the data economy in trade agreements, perhaps unaware that nothing could slow down the 21st century faster than data walls. Business may need to step forward, with the spirit of the airline industry after World War 2, when it set common standards to secure public trust around the world. As the Forum was told, the public in many countries now trusts business more than government when it comes to data. Our challenge is to convert that public trust to a public good. The annual Edelman Trust Barometer is released at the opening of the World Economic Forum, dropping a cold bucket of public opinion on delegates just as they’re adjusting to the crisp Alpine air. The barometer, which surveys 33,000 people in 27 markets, continues to show a clear majority distrust both government and media, while business has slowly regained most of what it lost in the financial crisis. If there’s a dominant concern, it’s the trust gap – the difference between the informed public and mass population – which is at a record high. Across the world, only one in five people think the system is working for them. That concern is especially prevalent in developed countries, where an overwhelming majority of the mass population believe they won’t be better off in five years. In Canada, only one-third of that population believes the future will be brighter. One of the reasons appears to be a growing anxiety over job losses. It’s not that people fear automation; they just worry they’re not being given the training or skills they’ll need to hold decent jobs in the decade ahead. We know the old social contract is fraying. We used to count on good public schooling, workplace security, decent pensions, accessible healthcare and affordable housing. But in many countries, a career is now a series of gigs, the price of education is soaring, and housing is beyond the reach of many young workers. Small wonder we’re seeing so much disquiet and its political cousin, populism. In the past, the public turned to governments for answers; now they’re looking to business to speak out and invest in practical solutions like skills training. The trust barometer found 76% of people – an astonishing 11-point jump in one year – expect CEOs to take the lead on change, with workplace inclusion, fair compensation and training at the top of their list. I spent the better part of an afternoon with about 50 of my peers from the United States, Europe and Asia, exploring perhaps the greatest leadership challenge in business: How to meet the demands of the world today, while positioning our companies for the complexities of tomorrow? We agreed it has to start with corporate purpose. We have a clearly articulated purpose at RBC, and it’s encouraging to see so many other global companies getting serious about it, too. Our group agreed if you don’t have the north star of purpose, you’re going to get knocked off course by the constant barrage of media and investor pressures. We agreed it’s critical for leaders to keep talking about medium-term objectives – the ones that, if they were running a sports team, would bridge the current scoreboard with the end-of-season standings. It’s also important for leaders to keep their boards and major shareholders aware of the trends they’re watching. I outlined how RBC has tried to manage this surge of short termism in the market by articulating our medium-term financial goals, and then spending a lot of time with shareholders to help them understand our differentiated strategy, the journey that we’ve planned and the map we’re following to get there. We believe that in an age of digital disruption, we can create something powerful to help our clients thrive and our communities prosper. That’s our purpose. A Hitachi executive explained to our group why the Japanese company is developing a social innovation business, to help address global income inequality and climate change, among other long-term goals. Their executive pay is now measured against those goals. Simple reason: if the world falters, Hitachi will falter. Pepsi presented its own case study of how it’s pursuing a corporate purpose rooted in human wellness. That may sound odd for a company built on soda pop, but this clarity of purpose helped it focus on healthier products and more sustainable packaging. When Pepsi’s board last year named Ramon Laguarta to replace longtime CEO Indra Nooyi, it weighed his ability to run a sustainable enterprise and deal with inclusive societies – and to communicate those needs with passion and humanity. We’re likely to see demand for such leaders grow, as our world becomes more complex and more demanding. Even though January has been a kinder month to equity investors, the December market rout was still fresh on everyone’s mind. Was the sell-off too sharp and sudden? If so, how much of that was driven by automation? I was part of a panel discussion on the growing role of machines in our markets, and what we need to consider to ensure equity while also driving efficiency. Adena Friedman, the CEO of Nasdaq, made the case that it’s never been a better time to be an investor, thanks to the efficiencies that automation has brought to markets. Costs have dropped more than 75%, she said; spreads between “bid” and “ask” prices are down as much as 90%. Of course, automation has been growing for decades at the back end of markets. But in recent years, its played a more profound role at the front end, determining what we invest in and how our investments are executed. One example: More investors are putting their money into passive investments such as Exchange-Trade Funds, or ETFs, rather than picking stocks themselves. It’s a popular and positive trend, as it gives small investors a more level-playing field with the big ones. It also carries some long-term risks, which Bill Ford, the CEO of General Atlantic, noted. He told our panel that passive shareholders now control 44% of U.S. stocks, up from 9% a decade ago. In many cases, that means there are fewer buyers and sellers of stocks. As market automation isn’t likely to slow, financial institutions will need to continue to find ways to help clients navigate those shortfalls in liquidity and any ensuing volatility. More broadly, we’ll also need to continue to better understand the consequences of passive investing – on investors and on companies that are watching these gyrations and wondering if this really is the best way to measure the value of what they’re trying to create. "Regulations have to evolve as rapidly as the planet’s needs, to spur new processes and wind down old ones"
A decade ago, Tony Blair came to Davos to urge the world to use the financial crisis to address the climate crisis. The billions – soon to be trillions – pouring into the balance sheets of stagnant economies, he argued, could be used to stimulate the transition to a lower carbon economy. Ten years on, the global economy is in much better shape; the environment, less so. Our collective shortfall in addressing climate change is now the No. 1 risk in the minds of the Davos community. In this year’s Global Risks Report, three of the top five risks ranked by likely outcome were environmental ones, while four of the top five ranked by impact were the same. Extreme weather was the biggest concern among the 1,000 members the World Economic Forum surveyed for the report, followed by a failure to mitigate and adapt to climate change. While there continues to be concern about the divergence in climate policy between the U.S., China and Europe, there was a lot of talk at Davos about how industries are moving ahead anyway. DHL, for instance, has designed electric vehicles to make its delivery fleet in European cities carbon neutral by 2025. Boeing has successfully tested a cargo plane using only biofuels. And two steelmakers, Mittal and Tata, are developing “green steel” using new energy sources and more recycled materials. Technology is only part of the play. Regulations have to evolve as rapidly as the planet’s needs, to spur new processes and wind down old ones. And much more could be done to connect energy systems. Daniel Yergin, the respected energy analyst, told the Forum he doesn’t see “peak oil” until at least 2040 – “and peak doesn’t mean plummet.” Supply chains, industrial processes and consumer choices, from home heating to commuting, are going to take time to change. And then there’s global population, projected to grow by 2 billion. Much of the discussion focused on finding ways to make our oil more carbon-efficient, to fuel that growth sustainably, and to use some of the revenue from old sources of energy to invest in the development of new ones. It’s why people call it a transition. Unfortunately, the technology that consumed so much of Davos’s attention is also disconnecting Greta’s generation from the natural world around them. 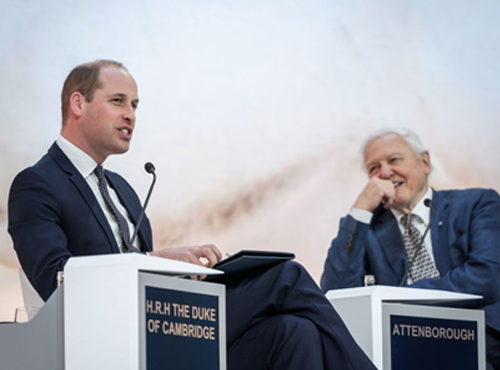 In another inspiring display of inter-generational conversation, Prince William (36) interviewed the legendary filmmaker David Attenborough (92) about his work in documenting the planet for more than half a century. Sir David described how in the 1950s, he could wow audiences with a simple shot of an armadillo, whereas today he has to go to the ocean floor or outer space to capture something that will grab people’s attention. He noted the irony: we’ve never been more exposed to nature and yet more disconnected from it. Sir David’s advice to the Duke of Cambridge and his generation: respect and revere the planet. And maintain “fresh eyes and wonder.” Wise words, for any age. Dave McKay is President and CEO of RBC, Canada’s biggest bank, and one of the largest in the world based on market capitalization. Dave is credited with helping transform the bank’s retail division and introduce new technology that has enabled RBC to adapt and evolve to rapidly-changing consumer demands. Dave McKay is President & CEO of RBC, Canada’s biggest bank, and one of the largest in the world by market capitalization. Dave is credited with helping transform the bank’s retail division and introduce new technology that has enabled RBC to adapt and evolve to rapidly-changing consumer demands. In 2015 he led the acquisition of City National Corp., creating a platform for growth with institutional, corporate and high net worth clients in the U.S. Dave joined RBC in 1988 as a computer programmer before moving to the retail banking arm. He held progressively senior roles in Canada and Japan in retail and business banking, group risk management, and corporate banking, ultimately becoming Group Head, Personal & Commercial Banking in 2012. A champion for Canada’s innovation ecosystem, Dave leads RBC’s support for and partnerships with universities, start-ups and accelerators, particularly in transformational technologies such as artificial intelligence and blockchain. He also advocates for youth, supporting the development of RBC Future Launch, a 10-year, $500 million commitment to help young people build the skills and capabilities required to succeed in a changing world.